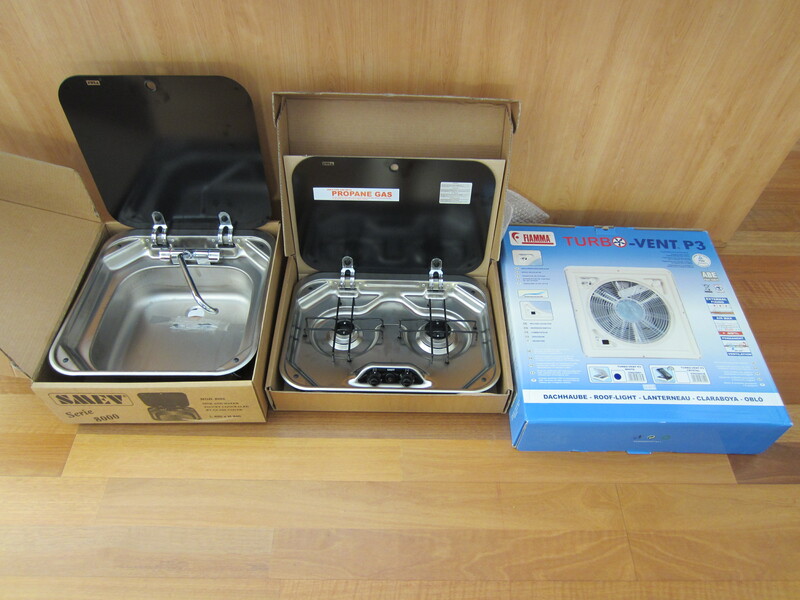 Caravans Plus has been a very useful supplier, we also bought the Thetford toilet and gas bottle casing there. And although they’re based in NSW, the delivery charge for everything in this picture was only about $30. It was obviously a cloudy day in Brisbane. 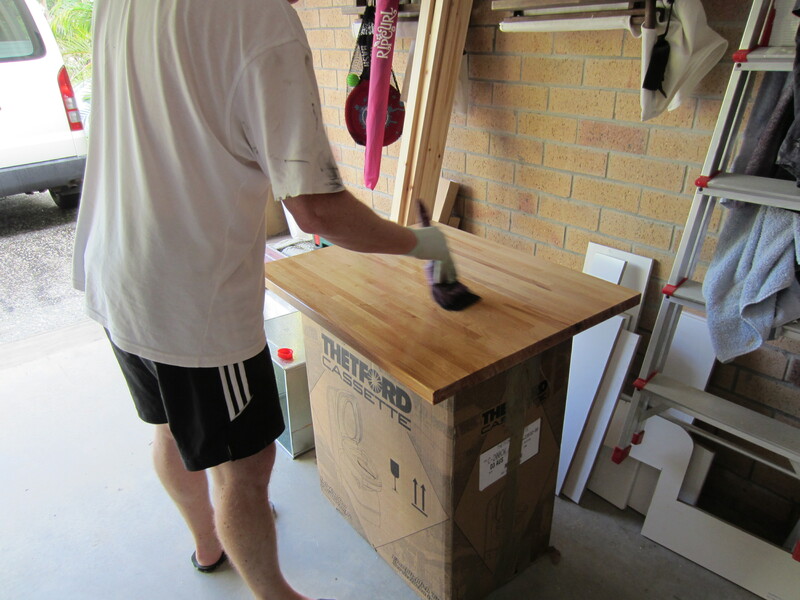 Paul also prepared the worksurface on the other side of the kitchen where the sink will sit. Neither the stove or sink are connected up to anything yet. The hardest bit with the worksurface was cutting around the handle next to the door – on the right hand side of the photo above. Paul used a cardboard template to cut around the edge, and the patent-pending right-angled pencil made another appearance. So here’s an overall view of the kitchen, I think it’s looking beautiful! Paul has already started work on the seating / bed configuration, so that will be the next chapter in the story. Just don’t mention the seat cushions. I was distressed to discover I have inherited no sewing genes whatsoever, and combined with an innate lack of patience and defiant new sewing machine, progress has been fairly slow. 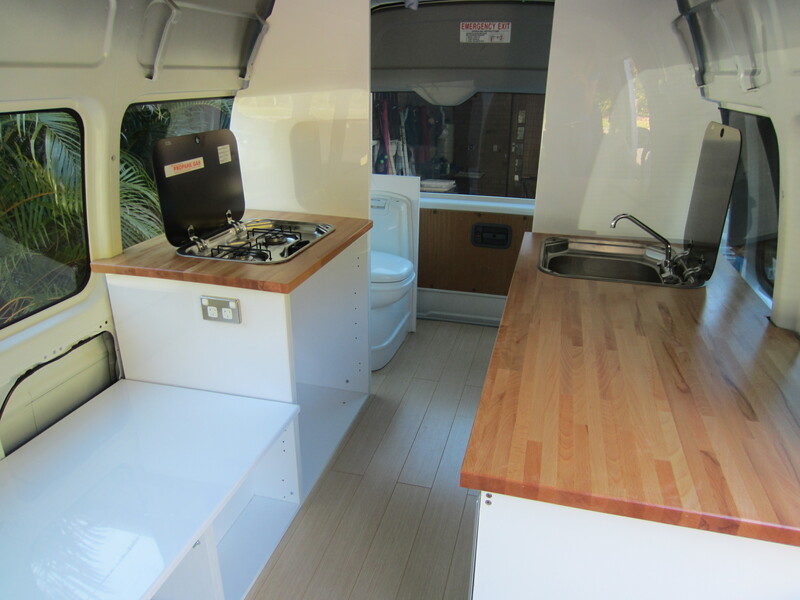 This entry was posted in Building a diy campervan, Campervan kitchen and cabinets and tagged Campervan conversion project, campervan fan, campervan kitchen, campervan kitchen sink, Campervan photos, campervan seat cushions, campervan stove, Campervan supplies, Caravans Plus, cardboard template, cheap delivery, Converting a campervan step-by-step, DIY campervan, sandpaper, timber oil, wooden worksurface by Rach. Bookmark the permalink. 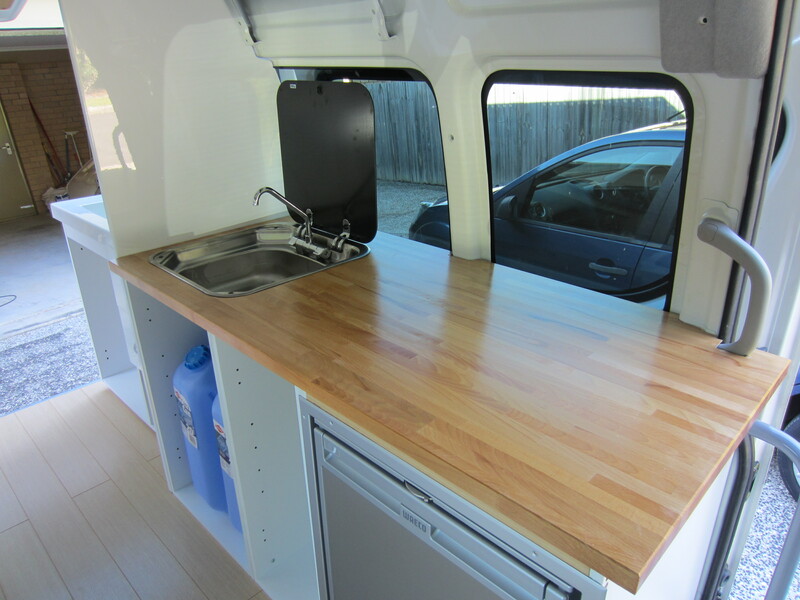 I am looking to convert a Typical Chevy or GMC High Top Conversion Van into a Camper. I can’t believe they’re aren’t any sites for this particular model….since they are everywhere and mechanical parts are plentiful in the USA. I haven’t found anyone who has done this yet! 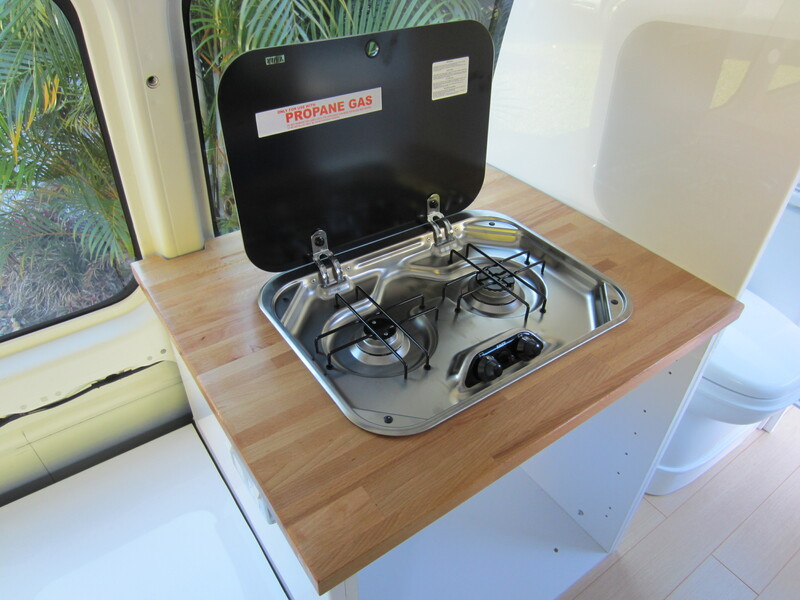 I would like to find a ready made kit that has the fridge, stove, microwave and sink all in one! Or at least plans for one. I’ve been looking for days and nothing. I am hoping you can help me. Thanks So much and great site you’ve got here! Hi JP – thanks for stopping by, I’m glad you like the blog! We haven’t come across an all-in-one combination, but I think they do exist. We wanted separate items so we could spread the weight (e.g. gas bottle and water tanks) over the two sides of the van. Hope you manage to find one though, and good luck with your conversion – it’s great fun! Howa are you doing and thanks for very good site! Or you can give me reference on Bunnings site, please? They are look pretty nice, gret job! Hi there, great blog! It is hard to find good fit out Info. 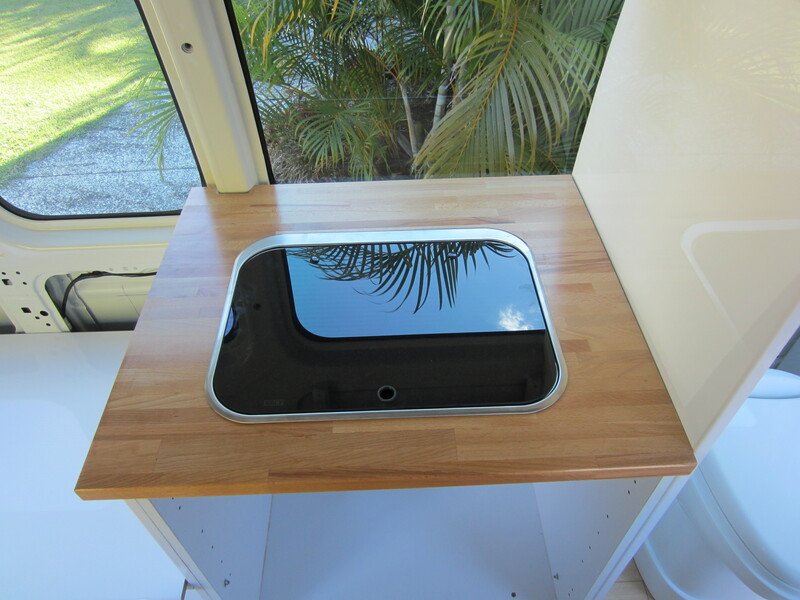 I am in the process of converting our Iveco Daily moto x van in to a camper/ surf wagon. Did you purchase the wood paneling as a lot or cut to size etc? ?